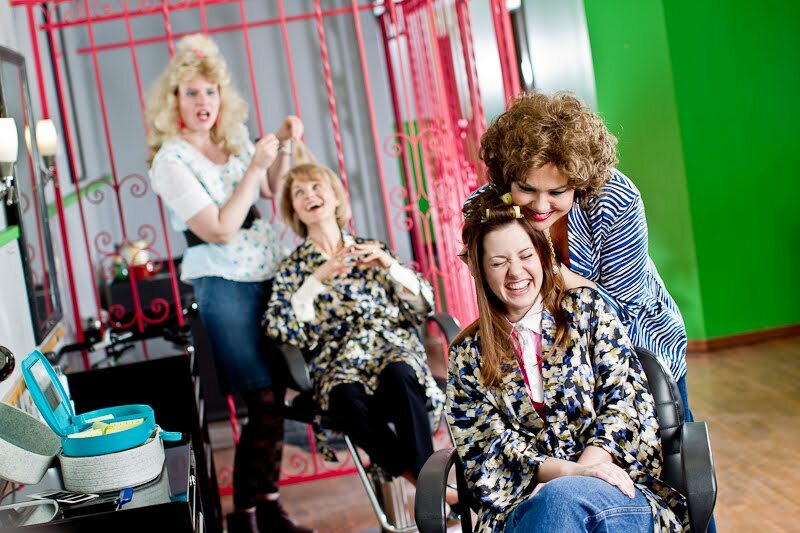 After the highly successful film adaptation of Steel Magnolias was released in 1989, many actresses performing in the play version have been required to take on a challenging task. 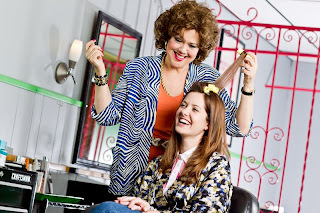 With a film that featured a cast of veteran performers like Sally Field, Shirley MacLaine and Dolly Parton, as well as a fresh-faced Julia Roberts, it can be difficult for others to look past these performances and for actresses to create a character of their own. 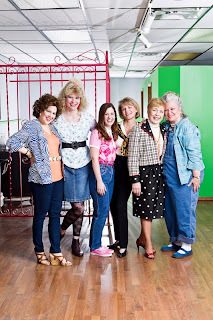 However, the cast members at the Omaha Community Playhouse say they are working to avoid the identical character trap. 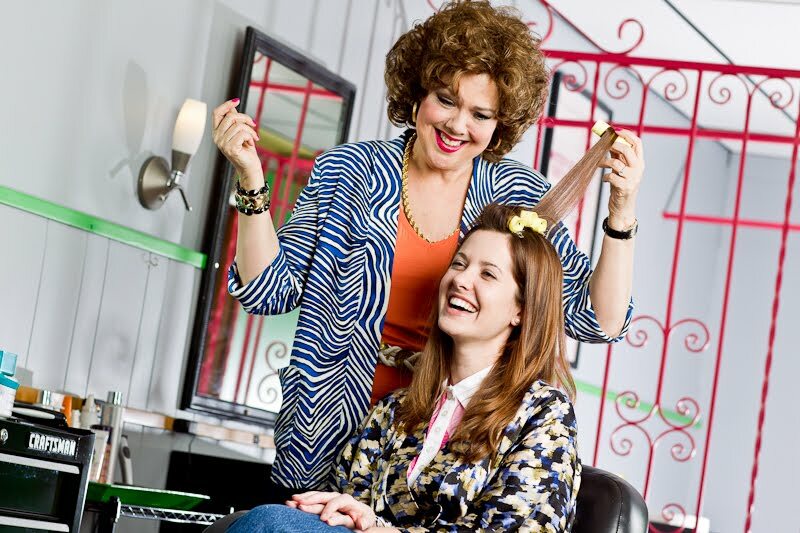 Brenda Ehrhart, who is playing the Sally Field role of M’Lynn, remembered seeing the film when it was first released, and she also saw OCP’s first production of the play. She carries memories from both versions; however, Director Amy Lane has helped her develop a fresh interpretation of the role. “[She] is doing an amazing job as our director in helping us to each explore our characters and their lives prior to where the show takes us,” Ehrhart said. “She has also worked with us to discover the background and interpersonal relationships of the characters. At this point in the creative process, the work Amy is doing with us is where I am gaining most of the character insight and development for M’Lynn.” Katie Kresha, who is playing M’Lynn’s daughter and the Julia Roberts role of Shelby, noted that although she is trying to make the character her own, she thinks she should not completely ignore Roberts’ performance. Jennifer McGill, who plays Annelle, noted that it is impossible not to be influenced by Daryl Hannah’s performance in the film, but she is using the script, Lane’s direction and her own personal experiences to develop her character. McGill has found connections with not only Annelle but also other characters in the play. 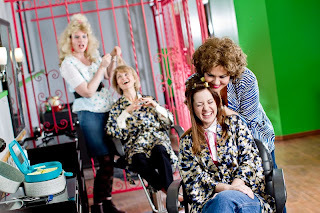 It is these types of relationships in the show that make it so well-loved, Connie Lee, who plays the Dolly Parton role of Truvy, noted. 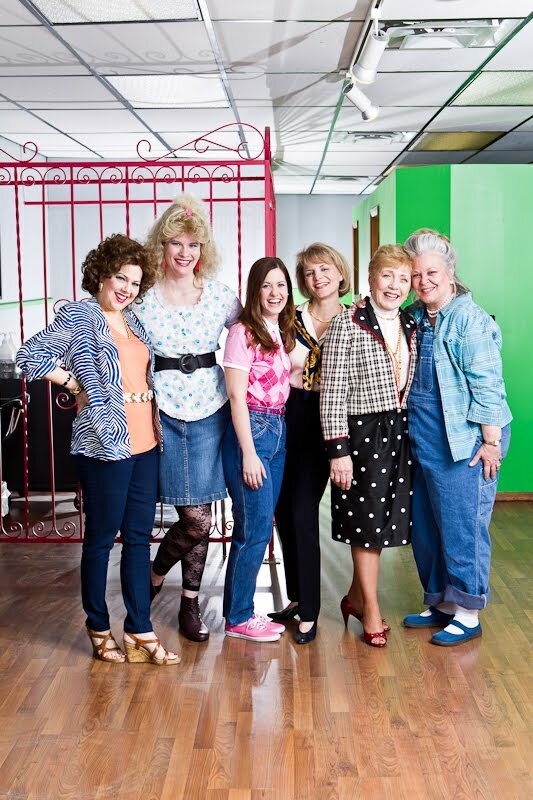 Don’t miss Steel Magnolias in the Howard and Rhonda Hawks Mainstage Theatre, April 15-May 8, Wednesday-Saturday at 7:30 p.m. and Sunday at 2 p.m. and 6:30 p.m. Tickets are $35 for adults and $21 students. For groups of 15 or more, adult tickets are $23 and student tickets are $15. To purchase tickets or for more information, call (402) 553-0800, visit the Box Office or click here. Join us for tea at 5–7 p.m. Celebrate memories, relive experiences, renew friendships and share photos with fellow tour members from past London Theatre Tours. Or if you have never been on the London Theatre Tour and are interested in learning more, visit with those who have gone and learn more about the trip! Hear details for the 2012 10th year anniversary Omaha Community Playhouse London Theatre Tour. The tour will be February 15-20, 2012 with an optional two-day tour extension to Dublin, Ireland and a performance at the Abbey Theatre, the national theater of Ireland. We’re saving a seat for you! Over the past nine years, the London Theatre Tour has contributed more than $25,000 to the Omaha Community Playhouse! Thank you for your support of high-quality live theater in Omaha. 21 & Over, the Omaha Community Playhouse's newest alternative program, is pleased to present The Further Adventures of Hedda Gabler! Henrik Ibsen’s tragic heroine, Hedda, last seen prostrate on a couch with a bullet hole in her head, makes a surprising return in Jeff Whitty’s (author of Avenue Q) wacky new comedy. Mired in an alternative hell where death is only possible when a fictional character is forgotten by the real-life public, Hedda faces an eternity of misery. Further Adventures of Hedda Gabler is a gleefully delirious, wildly imaginative ride as one of drama’s most tragic figures embarks on a journey to create for herself a new and improved ending. Save the date for the final show of the 21 & Over schedule for the 2010-11 season, the 2008 Pulitzer Prize and Tony Award-winning phenomenon August: Osage County, June 20, 2011. Sinfully cheap tickets for Nunsense! The secret is out. The nuns are offering sinfully low ticket prices for one performance only. On Wednesday, March 30 at 7:30 p.m., come see Nunsense at the Omaha Community Playhouse for only $20! Mention the discount in person at the Box Office or via phone at (402) 553-0800 to purchase tickets for $20 each; limit four per person. Tickets are subject to availability and not valid for previously purchased tickets. Join the "The Little Sisters of Aksarben" as they raise money to bury sisters who were accidentally poisoned by the convent cook, Sister Julia (Child of God). Wacky and outrageous with a hysterical anything goes sense of craziness. Nunsense is playing in the Howard and Rhonda Hawks Mainstage Theatre March 4-April 3, Wednesday-Saturday at 7:30 p.m. or Sunday at 2 p.m. or 6:30 p.m. Regular priced tickets are $40 for adults and $24 for students. For groups of 15 or more, adult tickets are $29 and student tickets are $18. To purchase tickets or for more information, call (402) 553-0800 or visit the Box Office. As part of the Omaha Community Playhouse's 21 & Over series, some of Omaha's top actors and actresses will be featured in three upcoming staged readings of plays considered to be some of the best of Broadway and off-Broadway in recent years. Show date: March 21, 2011, 7:30 p.m.
Show date: May 2, 2011, 7:30 p.m.
Show date: June 20, 2011, 7:30 p.m.
21 & Over performances and events are free and open to the public with an opportunity for donations. No tickets or reservations are necessary. The 21 & Over productions are intended for a mature audience and discretion is advised. For more information on 21 & Over and other OCP alternative programs, contact Amy Lane, Resident Director, at alane@omahaplayhouse.com or (402) 553-4890, ext. 164. One of the missions of ACT II is to promote the great work being done in theatre education by the Omaha Community Playhouse. On Saturday, February 19, ACT II sponsored a brand new event designed to introduce young children to the joy of theatre and to OCP. Nearly 150 children participated in the workshop, which included sessions on acting, improv, movement and a VIP tour of the Omaha Community Playhouse. The response was enthusiastic, dramatic and at times, loud! Watch for more upcoming ACT Out! Workshops in Fall 2011 and Spring 2012!